(CNS): The UK will support the George Town Port cruise berthing project, the premier has said, despite speculation that the strict conditions of the financial framework agreement (FFA) it wants Cayman to sign could rule out the development. McKeeva Bush said the FCO is content that a proper business case evaluation would be enough to meet the conditions of the financial plan and that KPMG is already working on the report. Speaking in the country’s parliament on Friday about his impromptu meeting with the FCO minister, Henry Bellingham, Bush said that the UK would not stop the port but had indicated that government must slow down. “He affirmed that a properly developed business case evaluation of the much-maligned cruise facilities project would satisfy their procedural requirements,” Bush said about his meeting with the Overseas Territories minister in London on 14 November. “The process to produce such an evaluation is well underway and is central to our assessment of the capabilities of the developer and the overall viability and sustainability of the project,” he added, indicating that local auditors KPMG were doing the evaluation. Bellingham would not be stopping the project, but Bush told his colleagues that the UK minister had indicated a need to slow down and complete the evaluation. The premier said that if his government was trying to rush through projects it was because he needed to stop the “disaster” of people losing their jobs, their homes and their business. “He says we must slow down … well, so be it,” Bush added. Although the MOU the premier signed with China Harbour Engineering Company has now expired, Bush has not yet indicated when, or if, government still intends to move to a main agreement with the Bejing based firm. The premier has said on a number of occasions recently at various public engagements that he intends to get the cruise port project done but has not revealed when that will be or what agreement government has come to with CHEC to ensure the Chinese owned firm will be able to recoup its investment, estimated to be as much as $300 million. CHEC is believed to be asking for a 51 year lease with retail concessions, as well as a significant share in the cruise line fees. According to the agreement with the UK, which Bush is expected to sign this week while he is in London for the Overseas Territories Consultative Council, the local government cannot borrow any more money for capital projects and must finance further development from its general revenue. The agreement also requires projects that will be financed through public-private partnerships to follow strict protocols, even if government is not putting up the initial cash, as is the case with the proposed cruise port project in George Town. The UK is calling for government to see that “all projects, whether funded from recurrent surpluses, conventional borrowing or all alternative financing transactions, are suitably appraised before the procurement stage” to ensure value for money. For projects with a lifetime value above CI$5m where the use of Pubic Private Partnerships (PPPs) or any other form of alternative financing is being considered, government must retain independent accounting, legal, financial, economic and environmental and other technical advice as appropriate to ensure robust investment appraisals are produced. “The business case which results from the appraisal process should demonstrate the economic need for the project; include a fully argued and costed risk and impact assessment; and specify the benefits the project is designed to deliver to ensure that an informed decision can be made on whether or not to proceed to the procurement stage,” the agreement, which Bush has said he will sign, states. The UK further requires government to make the evaluation of a project public and to follow a statutory procurement process, even with PPPs. See draft Financial Framework Agreement below. The police had asked the authorities to review this law to give officers the power to search anyone they believe may have a gun without a warrant in the same way that they can search premises if they suspect individuals may have drugs. The new law also makes a fundamental switch in the usual principles of justice and places the burden of proof on defendant’s facing charges in the court rather than the crown. Alleged offenders will now have to prove that an unlicensed a gun found in their car or home, for example, is not in their possession rather than the other way round. In future if a person is found with an illegal firearm on their premises they will have to explain why it is not their gun if they plead not guilty rather than the crown having to prove it is. As well as the new powers to search people, based only on suspicion and not evidence, the police will also be able to keep suspects in custody for 14 days without charging them with a crime. They will then be able to apply to the court to extend that detention period for another two weeks giving police almost amonth before they need to come up with a crime to keep holding a suspect. The amendments come as a result of requests made by the police who had stated that the laws they were using to deal with gang and gun crime were insufficient and prevented them being able to find illegal weapons. David Baines, the RCIPS commissioner had called for what he described as “practical legislation” in September after five men were gunned down in eight days. He said he wanted to see the burden of proof switched from prosecutors to defendants and officers given the ability to make warrantless searches whenever and wherever they have grounds to suspect guns are hidden. Asking for the barriers presented by the need for warrants and the need to prove a suspect has possession to be removed the commissioner said having the right legislation is important in the fight against gang crime. Some of the country’s legal profession, however, have raised questions about the constant encroachment by legislators on civil liberties in order to help law enforcement bolster weaker cases. One local attorney expressed the views of a number of lawyers when he said that changing laws to aid weak prosecution and poor police investigations will not stop the crime, just reduce the people’s rights. “Oppressive laws can only lead to further and more extreme acts of criminality,” Peter Polack an outspoken critic, warned. He pointed out that the problem of passing such an amendment would be unveiled once an innocent friend, relative or child is arrested. “If a firearm is found on a bus, is everyone to be arrested or just the driver?” the lawyer asked rhetorically as he pointed out the potential pitfalls in this type of legislation “If a firearm is found in a community meeting is everyone to be arrested or just the community leader? 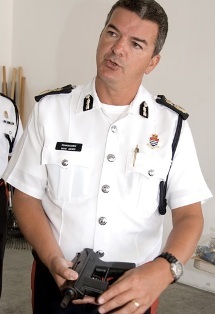 If the commissioner and 14 UK officers are on a North Sound cruise and an illegal firearm is discovered, are all to be arrested? We are already on the slippery slope and the leaders of non-performing institutions should be stepping aside instead of deflecting poor performance,” he added. (CNS): The member for North Side is not giving up his fight to persuade government to change the election law to one man-one vote before the country goes to the polls in 2013. Besides seeking redress in the court system, Ezzard Miller said he would be filing another motion in the Legislative Assembly for next month’s meeting, this time calling for amendments to section 44 of the law as another way of achieving his goal. The silence on the government benches last week in response to his previous motion spoke volumes, Miller said, making it clear that government has no viable argument against one man-one vote. 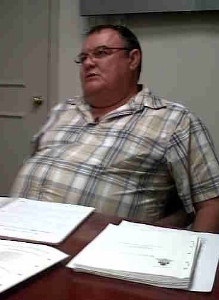 Speaking at a press conference on Monday afternoon at the Legislative Assembly, the independent member said he would continue to file motions right up until the parliamentary dissolution before the general election in 2013 if he had to, as he believed the majority of people in the Cayman Islands now supported the concept of casting one vote for one member to represent them. Miller believes there is now much wider recognition in the community of the inequity of the current convoluted system than ever before and Cayman wants one man-one vote. 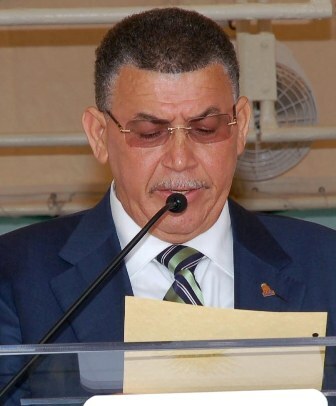 If government persists with plans revealed by the premier earlier this year to simply increase the number of members at the next election by adding two seats to George Town and one to Bodden Town, Miller said, McKeeva Bush and his three fellow West Bay members may have difficulty maintaining support for the multi-member system going into the next election. For the first time, constituents in West Bay will have less influence over how many people are elected to power than their neighbours in the capital, who will, unless the law is changed, be able to return six people to the country’s seat of power compared to only four in West Bay. He said that the silence of the government benches in the Legislative Assembly last Thursday, when not a single member of government rose to argue against Miller’s private members motion, shows how indefensible the government’s support of multi-member constituencies is. The silence in response to his motion was not only against all parliamentary protocol and extremely unusual, but Miller said he believed the government benches could do little else if they are not prepared to support the democratic principle of one man-one vote. However, he pointed out that they would all get another chance to explain to their constituents why they are not supporting the basic principle of democracy when he brings his next motion and if necessary another one after that as well. Surprised but undeterred by the silent response, Miller said that as far as he is concerned the legislation governing the country’s elections is now unconstitutional, as section 92 calls for people who are eligible to vote for “an elected member, not four,” he said again on Monday. Well aware that the premier is fundamentally opposed to the principle of single member constituencies, Miller said the McKeeva Bush was not above the constitution and he intended to carry on with his campaign. Despite the likelihood of constant rejection and although he himself is already elected via the principle of one man-one vote as a result of representing a single member constituency, Miller said the fight was not to advance his own chances of winning an election but to do what was right.